Albert G. McConnell, 82, father of Mrs. Perry Moore of Harrisburg, died at his residence in Raleigh, Sunday. The body will lie in state at the Courtney funeral home in Galatia. The funeral will be held at the Raleigh Baptist church at 3 p.m. Tuesday. Rev. C. E. Russell pastor of the church of which he was a member, will officiate and burial will be in the Masonic cemetery at Raleigh. Mr. McConnell leaves his wife, Lillian, his daughter, Mrs. Perry (Hazel E.) Moore; and his son, Glen McConnell of Pontiac, Mich. His sister Mrs. Sally Compton, Vederburg, Ind., 5 grandchildren and 10 great grandchildren, also survive. He was preceded in death by his former wife Emma Webber McConnell in 1910, the mother of his children and by a son, Webber McConnell, in 1954. Nephews of Mr. McConnell will be pallbearers and nieces, flower girls, at the funeral. Charlie Webber, 71, a lifelong resident of Galatia died Thursday afternoon at a Cairo hospital where he had been a patient for the past year. Funeral services will be at 2 p.m. Saturday at the Courtney funeral home in Galatia with the Rev. Bill Simms of Benton officiating. Burial will be in the Webber Camp Ground cemetery. 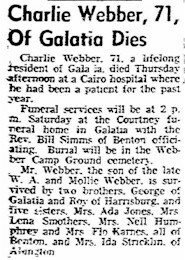 Mr. Webber, the son of the late W. A. and Mollie Webber, is survived by two brothers George of Galatia and Roy of Harrisburg, and five sisters Mrs. Ada Jones, Mrs. Lena Smothers, Mrs. Nell Humphrey and Mrs. Flo Karnes, all of Benton, and Mrs. Ida Stricklin of Alington. The late C. H. Burnett, Eldorado millionaire who died Jan. 14, left the bulk of his estate to his sister, Pet. B. Speer of Eldorado, his will which was filed for probate yesterday revealed. The Bond filled by the executrix, $1,840,000, is the largest ever filed in probate court here, it was learned. Mr. Burnett, who never married, was familiarly known as "Colonel" Burnett. For years he headed the C. P. Burnett and Sons Co. in Eldorado, which owned a grocery, dry goods, men's clothing, women's clothing, shoe, furniture and hardware stores, a lumber yard and the C. P. Burnett and Sons, Bankers, in Eldorado. In recent years he had sold out his retain holding and the bank maintaining his interest in the lumber yard. To Gail Burnett of Los Angeles, daughter of a deceased brother, $5,000. Also listed were bequests of $5,000 to Guy Burnett and Edwin Burnett of Eldorado, nephews, but they had died between the time the will was written and its filing for probate, and it was learned that these bequests go back into the estate and not to their heirs as the bequests are termed lapsed legacies. The will said that the remainder of the estate should go to his sister, Pet. B. Speer, to her and her heirs forever to keep, sell or dispose of as she chooses, upon condition that she pay to his sister Elizabeth B. Lynn of St. Louis, $2,000 each year upon the anniversary of the date of his death, as long as Mrs. Lynn shall live. The will also pointed out that Mr. Burnett owned a half interest, Mrs. Speer a fourth interest and Ernie Tate a fourth interest in the Burnett Lumber Co., and provided that Mrs. Speer, whom the will appointed as executrix, should be substituted for him as partner in the lumber company. The estate is being handled by two Benton attorneys, Roy Martin and Moses Pulverman. C. Clyde Webber, 77, a retired merchant, died Sunday morning at his home in Galatia following an illness of two years. The funeral will be at 2:30 p.m. Wednesday at the Courtney funeral home in Galatia with the Rev. Ellis Davis, paster of the Galatia Methodist church where Mr. Webber was a member, officating. The family has requested that no flowers be sent. Burial will be in the Webb Camp Ground Cemetery. Mr. Webber wa associated with his brother, the late Arthur Webber, in the Webber Hardware company, at Galatia for a number of years. Surviving are his widow, Mrs. Nora Webber, a saleslady at Pel___ Fabric and Decorating shop in Harrisburg, and a sister Mrs. Ural (Madge) Tuttle of Casey. Mr. Webber was the oldest son of the late Charles C and Margaret A. Webber. Two brothers, Arthur and Gussie, and a sister, Mabel, prodeded him in death. Dr. C. W. Whitely, 66, well known Harrisburg dentist, died suddenly yesterday at 1:30 p.m. at the Mayo Clinic in Rochester, Minn. He had been in failing health for several months. He leaves his wife, Mrs. Sybil Webber Whitley; one son, Marion, of Marion; two daughters Mary Elizabeth Royalty, Dayton, Ohio, and Mrs. Jane Rose Acton, Danville, and one sister, Mrs. Hallah Whitley Mulholland, Los Angeles, Calif. The body is being returned to Harrisburg by plane from the Turner funeral service and is expected to arrive sometime tonight. 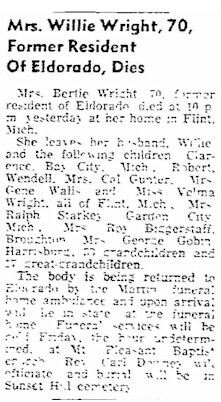 Mrs. Mary Webber and sons, Archie and Billy, left Sunday for Kalamazoo, Mich., to attend the funeral of Mr. Bessie VanTrease. They will return Wednesday with Bennett Webber, who had gone earlier to be with his sister. Mr. and Mrs. Allie Golliher, Perry Peeble and Mary Webber went to Kalamazoo, Mich., to atten the funeral of their sister-in-law, Bessie Vantrease, who was killed in an auto accident Friday night. Her funeral was held in Kalamazoo Tuesday. Mrs. Janie Webber has returned from Michigan. Her visit was shortened by the death of her daughter, Mrs. Bessie VanTrease. 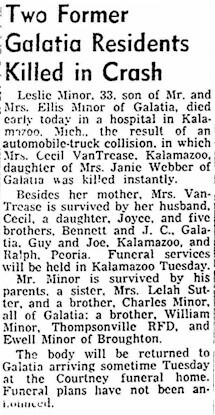 Leslie Minor, 33, son of Mr. and Mrs. Ellis Minor of Galatia, died early today in a hospital in Kalamazoo, Mich., the result of an automobile-truck collision in which Mrs. Cecil VanTrease, Kalamazoo, daughter of Mrs. Janie Webber of Galatia was killed instantly. Besides her mother, Mrs. VanTrease is survived by her husband, Cecil, a daughter, Joyce and five brothers, Bennett and J. C., Galatia, Guy and Joe, Kalamazoo, and Ralph, Peoria. Funeral services will be held in Kalamazoo Tuesday. Mr. Minor is survived by his parents, a sister, Mrs. Lelah Sutter, and a brother Charles Minor all of Galatia; a brother William Minor, Thompsonville RFD, and Ewell Minor of Broughton. The body will be returned to Galatia arriving sometime Tuesday at the Courtney funeral home. Funeral plans have not been announced. Newby Fred Elder, 83, died at 9 p.m. Monday at his home, 1105 Walnut street, in Eldorado. He had been ill with a heart ailment for about two weeks. Born in Raleigh he had lived in Saline county all of his life and was engaged in farming until the time of his retirement. He is survived by his wife, Carria; two sons Ore and Glen Elder of Raleigh, and a daughter, Mrs. Hallie Burnett, Eldorado. A daughter, Mrs. Fauline Lappin, preceded him in death as did his first wife the former Jennie Webber. Also surviving is a sister, Mrs. Florence Carpenter, Eldorado, and four grandchildren. The body which was taken to the Eldorado funeral home has been returned to the family home where funeral services will be conducted at 2 p.m. Thursday. The Rev. C. M. Weaver of Johnston City will officiate assisted by the Rev. Stanley Anderson, pastor of the Calvary Baptist, and the Rev. C. R. Moore, pastor of the First Baptist church of Eldorado. Burial will be in Wolf Creek cemetery. "Joe was wounded very badley on April 13th, when we had a very hard fight. Joe was among many who were shot by snipers and artillery fire. It was during an attempt to take a town and some bridges, in the tonw that we suffered so many casualties. I say Joe shortly after he was hit and he was unconscious then. He really did not suffer any pain as he must have become unconscious whe he was hit. "The doctors did everything possible for him but it was to no avial and Joe died a few hours afterward without ever recovering consciousness. "He was doing a fine job with his company and got along wondurfully with the men and officers. Unfortunately he was hit, because he would have received a promotion for his fine work as a toprate soldier. "I was with Joe for quite some time after he was hurt, and I said some prayers for him. Joe was buried in the American Military cemetery in Holland with a chaplain saying prayers for him while he ws being buried. "Again, please accept my sincere sorrow for you and your children; tell them their daddy was a grand soldier. I'll be remembering Joe and you all in my prayers. His wife and two daughters live at Benton. Mrs. Nellie Burnett Hick, widow of the late Dr. John C. Hick, Eldorado, died at 1 a.m. today. Surviving are her two brothers, Col. c. H. Burnett, Eldorado and Lawrence Burnett,l Los Angeles, Calif., three sisters Mrs. W. S. Speers, Eldorado, Mrs. John F. Lynn, St. Louis, and Mrs. C. H. Randall, Los Angeles, Calif.
She was an alumna of Lindenwood College, St. Charles, Mo., and was a charter member of the Calvary Baptist church, the Eldorado chapter of the Order of Easter Star and of the Samuel Elder chapter of the Daughters of the American Revolution. Arrangements for the funeral will be announced Saturday according to information from Martin funeral home. William J. Webber, 81, former resident of Raleigh,l died at 8:45 p.m. Wednesday at Cloverdale, Ind., following a nine-week illness. He was born June 29, 1875, in Raleigh, the son of Nelson Webber and Elizabeth Rhine. He was married to Rhoda Quick who preceded him in death on Feb. 1, 1930. He was a member of the Raleigh Baptist church and the Modern Woodmen of Franklin, Ind. Mr. Webber is survived by two daughters, Mrs. Ivan (Eva) Craggss, Cloverdale, Ind., and Mrs. Chloe Hazelrigg, Milroy, Ind., three grandchildren and five great-grandchildren. Funeral services will be held Saturday at 2 p.m. at the Raleigh Baptist church with the Rev. H. Todd Taylor officiating. Interment will be in the Raleigh Masonic cemetery. His body will lie in state at the church from 11 a.m. Saturday. William S. Speer, 1104 North Walnut street, Eldorado, died of a complication of diseases and following a long illness at 11 a.m. Friday at the family residence. His funeral will be held at the home at 2 p.m. Sunday, conducted by the Rev. Stanley Anderson, Calvary Baptist church pastor, and burial will be at Big Prairie cemetery in White county. 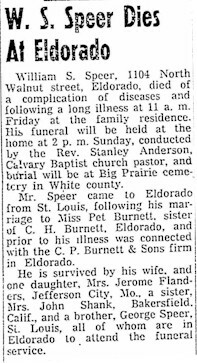 Mr. Speer came to Eldorado from St. Louis, following his marriage to Miss Pet Burnett, sister of C. H. Burnett, Eldorado, and prior to his illness was connected with the C. P. Burnett & Sons firm in Eldorado. 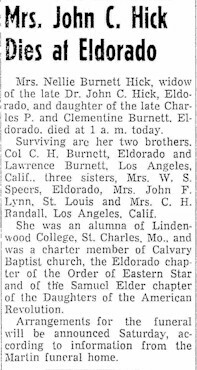 He is survived by his wife, and one daughter, Mrs. Jerome Flanders, Jefferson City, Mo., a sister, Mrs. John Shank, Bakersfield, Calif., and a brother, George Speer, St. Louis, all of whom are in Eldorado to attend the funeral service. Funeral services will be held at 2 p.m. Wednesday at Lone Oak church for W. N. McConnell, 82, known to his friends as "Uncle Bill," whose death occurred Monday evening at his farm home southwest of Raleigh, south of Lone Oak church. The Rev. Charles Holland of Ridgeway will officiate and burial will be in the Masonic cemetery at Raleigh. 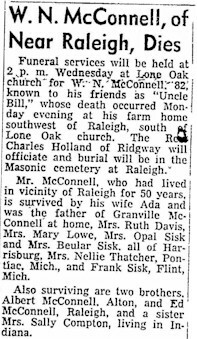 Mr. McConnell, who had lived in vicinity of Raleigh for 50 years, is survived by his wife Ada and was the father of Granville McConnell at home, Mrs. Ruth Davis, Mrs. Mary Lowe, Mrs. Opal Sisk, and Mrs. Beular Sisk, all of Harrisburg, Mrs. Nellie Thatcher, Pontiac, Mich., and Frank Sisk, Flint, Mich.
Also surviving are two brothers, Albert McConnell, Alton, and Ed McConnell, Raleigh, and a sister Mrs. Sally Compton, living in Indiana. 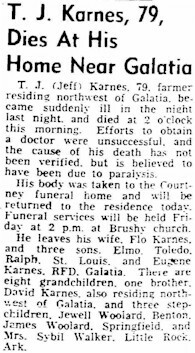 T.J. (Jeff) Karnes, 79, farmer residing northwest of Galatia, became suddenly ill in the night last night and died at 2 o'clock this morning. Efforts to obtain a doctor were unsuccessful, and the cause of his death has not been verified, but is believed to have been due to paralysis. His body was taken to the Courtney funeral home and will be returned to the residence today. Funeral services will be held Friday at 2 p.m. at Brushy church. 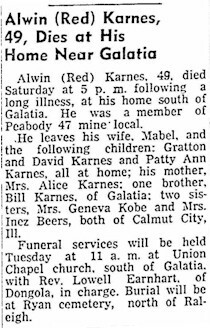 He leaves his wife, Flo Karnes, and three sons, Elmo, Toledo, Ralph, St. Louis, and Eugene Karnes, RFD, Galatia. There are eight grandchildren, one brother, David karnes, also residing northwest of Galatia, and three step children, Jewell Woolard, Benton, James Woolard, Springfield, and Mrs. Sybil Walker, Little Rock, Ark. 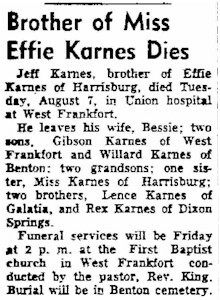 Jeff Karnes, brother of Effie Karnes of Harrisburg, died Tuesday, August 7, in Union hospital at West Frankfort. Funeral services will be Friday at 2 p.m. at the First Baptist church in West Frankfort conducted by the pastor, Rev. King. Burial will be in Benton cemetery. Berry Carnahan, 81, Eldorado, known to many friends asd "Uncle Berry" and father of Mrs. Guy Burnett, Eldorado, died early this morning at a sanitarium in Alton, where he had been a patient for several months. His death was attributed to old age. Since the death of his wafe, Mrs. Mary Alice (Allie) Carnahan, which occurred four years ago, he had lived with his children, spending most of his time in Eldorado and at the home of a daughter, Mr. S. W. Haley, St. Petersburg, Fla. While visiting a son, Claude, at Bunker Hill, he became ill and was taken to the Alton sanitarium. Another song, Arthur, lives at Long Island, N.Y. There are nine grandchildren and five great grandchildren and a sister, Mrs. Lulu Bramlet, lives in Springfield. Mr. Carnahan was a member of the Primitive Baptist church and was a staunch Democrat in politics, but had never sought election to office. His body is being returned to Eldorado in a hearse from the Eldorado funeral home and will like in state at the home of Mrs. Burnett, 1809 Glenwood avenue, where the funeral service will be held Thursday at 2 p.m. Elder T. Leo Dodd will conduct the service, and burial will be at Wolf Creek cemetery. Norval Burnett, 73, died at 6:45 a.m. today at his home in Eldorado and his body lies in state at the Martin funeral home. Funeral arrangements will be announced Saturday. He was a carpenter and a farmer and had been ailing for the past six months. His will, Rachel, a daughter, Edna at home, Mrs. Ralph (Helen) Bramlet, Chicago, Mrs. H.H. (Madeline) Fraser, Warnetka, Mrs. Eugene (Fay) Gasaway, Alton, are the surviving children. There are three grandchildren, Ann and Bob Fraser, and James Gasaway, and three sisters. Mrs. John Webber, Evansville, Mrs. George Bramlet, Detroit, and Mrs. Edna Burnett, Eldorado. 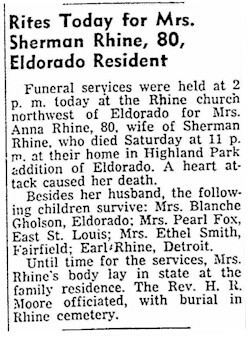 Funeral services wer held at 2 p.m. today at the Rhine church northwest of Eldorado for Mrs. Anna Rhine, 80, wife of Sherman Rhine, who died Saturday at 11 p.m. at their home in Highland Park addition of Eldorado. A hear attack caused her death. Besides her husband, the follow children survive: Mrs. Blanche Gholson, Eldorado; Mrs. Pearl Fox, East ST. Louis; Mrs. Ethel Smith, Fairfield; Earl Rhine, Detroit. Until time for the services, Mrs. Rhine's body lay in state at the family residence. The Rev. H.R. Moore officiated, with burial in the Rhine cemetery. 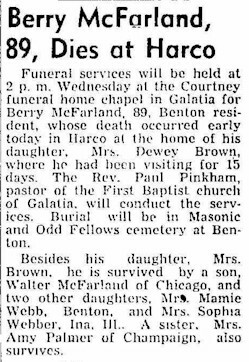 Funeral services will be held at 2 p.m Wednesday at the Courtney funeral home cahpel in Galatia for Berry McFarland, 89, Benton resident, whose death occurred early today in Harco at the home of his daughter, Mrs. Dewey Brown, where he had been visiting for 15 days. The Rev. Paul Pinkham, pastor of the First Baptist church of Galatia, will conduct the services. Burial will be in Masonic and Odd Fellows cemetery at Benton. Besides his daughter, Mrs. Brown, he is survived by a son, Walter McFarland of Chicago, and two other daughters, Mrs. Mamie Webb, Benton, and Mrs. Sophia Webber, Ina, Ill.. A sister, Mrs. Amy Palmer of Champaign, also survives. S. G. "Sep" Lusk, 81, died Saturday at 9 p.m. at his residence north of Raleigh of a heart attack. The funeral will be Wednesday at 2 p.m. at the Gaskins funeral home with Rev. stephen Vitrano, of Mt. Vernon officiating. The Masonic lodge at Raleigh will be in charge of burial rites. He was a member of the Masons for fifty years. He will be buried at the Raleigh Masonic cemetery. The son of Mr. and Mrs. Thomas Luck, he was born in Rockport Ind., in 1867 and later married Lucy Glascock, who preceded him in death 10 years ago. The following children survive: Mrs. John (Francis Louise) Mason, Raleigh, and Seward, Tom, and Victor, all of Detroit, Mich., John, Grass Valley, Calif., and a step-daughter, Gleda Fiveash, East St. Louis, Ill. He has fourteen grandchildren. For several years he operated general merchandise stores in and around Harrisburg and a tobacco factory in Raleigh with his father. 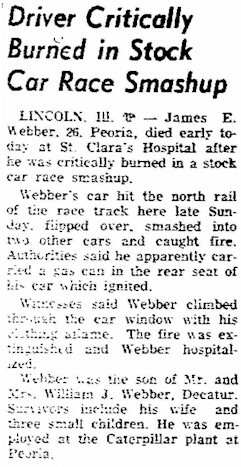 LINCOLN, Ill. - James E. Webber, 26, Peoria, died early today at St. Clara's Hospital after he was critically burned in a stock car race smashup. Webber's car hit the north rail of the race track here late Sunday, flipped over, smashed into two other cars and caught fire. Authorities said he apparently carried a gas can in the rear seat of his car which ignited. Witnesses said Webber climed out of the car window with his clothing aflame. The fire was extinguished and Webber hospitalized. Webber was the son of Mr. and Mrs. William J. Webber, Decatur. Survivors include his wife and three small children. He was employed at the Caterpillar plant at Peoria. Mrs. Lilly Lowe died near Hollowell, Kansas with a conjestive chill at 9 p.m. September the 27th. Her brothers reached Galatia with her remains Sunday morning, and she was buried at eleven o'clock in the Camp Ground. A large concourse of relatives, and friends were present and the deepest sympathy is felt by the entire community for the bereaved husband, parents and relatives in this sad affliction. The deceased was the daughter of Mr. Nel Webber of Raleigh, and in company with her husband, M. T. Lowe, and a party of friends, left this county only a few days past to make their home in Kansas. The party liked only about two days of their journey's end when Mrs. Lowe suddenly died. Murder due to liquor: Arch Weber of Galatia, was fatally cut by David M. Bissonette Monday afternoon a short distance northwest of this city, an artery in the left arm was sevred, and the victim died at an early hour tuesday morning at a farm house where he had been taken. the young man was a son of Elijah Webber, and about 27 years of age. He leaves a wife and two children. The funeral took place Tuesday afternoon at the Webber Campground. Men Riding in Carriage Come to Blows One Being Killed. 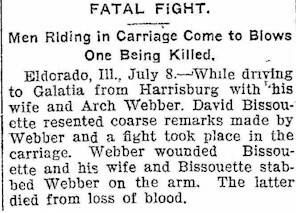 Eldorado, Ill, July 8 - While driving to Galatia from Harrisburg with his wife and Arch Webber, David Bissouette resented coarse remarks made by Webber and a fight took place in the carriage. Webber wounded Bissouette and his wife and Bissouette stabbed Webber on the arm. The latter died from loss of blood. Alwin (Red) Karnes, 49, died Saturday at 5 p.m. following a long illness, at his home south of Galatia. He was a member of Peabody 47 mine local. 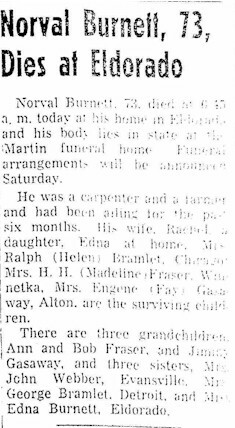 He leaves his wife, Mabel, and the following children: Gratton and David Karnes and Patty Ann Karnes, all at home; his mother, Mrs. Alice Karnes; one brother, Bill Karnes, of Galatia; two sisters, Mrs. Geneve Kobe and Mrs. Inez Beers, both of Calmut City, Ill.
Funeral services will be held Tuesday at 11 a.m. at Union Chapel church, south of Galatia, with Rev. Lowell Earnhart, of Dongola, in charge. Bural will be at Ryan cemetery, north of Raleigh. Mrs. Nancy Etta Webber, 68 years old and a well-known resident of Eldorado, died at 10 o'clock last night at the Ferrell hospital in Eldorado. She had been ill for two weeks due to a heart ailment. 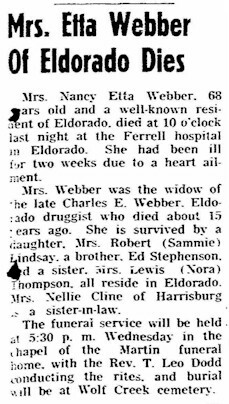 Mrs. Webber is the widow of the late Charles E. Webber, Eldorado druggist who died about 15 years ago. She is survived by a daughter, Mrs. Robert (Sammie) Lindsay, a brother, Ed Stephenson and a sister, Mrs. Lewis (Nora) Thompson, all reside in Eldorado. Mrs. Nellie Cline of Harrisburg is a sister-in-law. The funeral service will be held at 5:30 p.m. Wednesday in the chapel of the Martin funer home, with the Rev. T. Leo Dodd conducting the rites and burial will be at Wolf Creek cemetery. Funeral services were held at 2 p.m. today for Charles H. Karnes, 73, who died Saturday afternoon at his home two miles west of Galatia following about a month's illness. Surviving are the following children: Mrs. Nellie Pittman, Mrs. Reccie Tate, and Charles Karnes, Jr., Galatia; Cloyd Karnes, Benton; Mrs. Ruby Buck, Chicago; Mrs. Winnie White, Detroit; Mrs. Rose Carnahan, San Bernardino, Calif.; Dowsey Karnes, Los Molnois, Calif.; Mrs. Emma Schof, St. Louis; Mae Karnes, Baynor, Mo; Mrs. Flossie Dewey, Alton. Two brothers and two sisters survive: Dave and Jeff Karnes, Galatia; Mrs. Sadie Kane, Broughton, and Mrs. Emma Morris, Harrisburg. The Rev. W. A. Cowgur officiated at the funeral services held at Bethel Creek church east of Galatia, and interment was in the church cemetery. 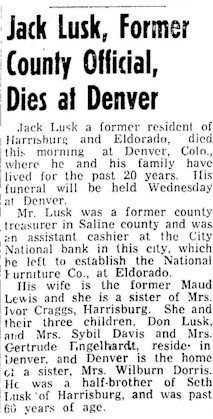 Jack Lusk a former resident of Harrisburg and Eldorado, died this morning at Denver, Colo., where he and his family have lived for the past 20 years. His funeral will be held Wednesday at Denver. Mr. Lusk was a former county treasurer in Saline county and was an assistant cashier at the City National bank in this city, which he left to establish the National Furniture Co., at Eldorado. His wife is the former Maud Lewis and she is the sister of Mrs. Ivor Craggs, Harrisburg. She and their three children, Don Lusk, and Mrs. Sybil Davis and Mrs. Gertrude Englehardt, resided in Denver and Denver is the home of a sister, Mrs. Wilburn Dorris. He was a half-brother of Seth Lusk of Harrisburg, and was past 60 years of age. Edwin W. Burnett, 58, Eldorado resident, died at 6:45 p.m. Thursday at Welborn Memorial hospital, Evansville, Ind. He had been in failing health for three years and had been seriously ill for two weeks. Mr. Burnett, co-owner of the Town House cafe on route 45, near Eldorado, is survived by his wife, the former Hallie Elder, and by one brother Guy Burnett, also of Eldorado. A daughter, Carolyn Burnett,preceded him in death in 1940. He was a World War one veteran and a member of the Calvary Baptist church where funeral services will be conducted at 3 p.m. sunday. The Rev. Stanley Anderson, pastor of the church, will officiate at the services, assisted by the Rev. Charles Branum, pastor of the Eldorado Church of Christ. Burial with military rites will be in Wolf Creek cemetery. The body, received by the Bean and Tanner funeral home, has been moved to the Burnett home, 1105 Walnut street, and will lie in state at the church for the hour preceeding funeral services. Richard Lappin, nephew of Mr. Burnett, will assist with arrangements. 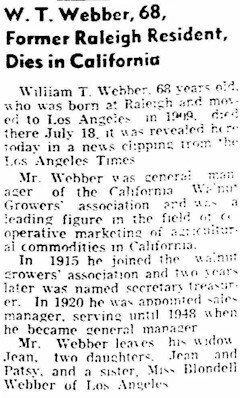 William T. Webber, 68 years old, who was born at Raleigh and moved to Los Angeles in 1909, died there July 18, it was revealed here today in a news clipping from the Los Angeles Times. Mr. Webber was general manager of the California Walnut Growers association and was a leading figure in the field ____ operative marketing of agricultural commodities in California. In 1915 he joined the walnut grower' accociation and two years later was named secretary treasurer. In 1920 he was appointed sales manager serving until 1948 when he became general manager. Mr. Webber leaves his widow, Jean, two daughters, Jean and Patsy, and a sister, Miss Blondell Webber of Los Angeles. Mrs. Hannah Wright, 84, wife of J. R. Wright, Stonefort, died at noon Friday at their home at STonefort, where she had been ailing for some time, due to infirmities of old age. She was the mother of Mrs. Roy Rievley, Harrisburg, and J. S. and Pearl Wright, who operate the J. S. Wright and Co. store at Stonefort. They and her husband survive. Her husband is a retired dispatcher employed for many years by the New York Central at Mt. Carmel and other terminals. Born and reared at Stonefort, Mrs. Wright was the daughter of the late Lewis and Letitia Oshel, and was a sister of the late Mrs. E. B. Goe, Eldorado, and Albert Oshel, Stonefort, who are well remembered among family friends. Her funeral will be held at 2:30 p.m. Sunday at the Thornton funeral home, the Rev. Cecial Hardy officiating, and burial will be at Robinson cemetery. The body will remain at the funeral home but the casket will be closed at the time of the funeral and will not be reopened. Lorenzo (Lannie) Limerick, 83, a retired Galatia business man, died early Sunday morning at his home in Galitia. For many years he was a partner in the Limerick Brothers Mercantile company at Galatia and Carrier Mills. The funeral will be at 3 p.m. Tuesday at Galatia Presbyterian church, where he was a member, with the pastory, the Rev. Barney Series of Thompsonville, officiating. The Galatia Masonic lodge No. 684 will conduct rites at the service. Burial will be in the Webber Campground cemetery. The body will remain at the Courtney funeral home in Galatia until 2 p.m. Tuesday when it will be taken to the church to lie in state for an hour before the funeral. Mr. Limerick's wife, the former Miss Laura Lusk, died in 1938. Surviving are two daughters. Mrs. Rober I. (Marie) Spradlin, Rockport, Ind., and Mrs. Max W. (Lillian) Ulery, Dallas, Texas; a sister, Mrs. C. A. Bailey, Springfield, and a brother, Bert Limerick, Chicago. Mr. Limerick was a Mason and also a member of I.O.O.F. lodge No 433. Mrs. Charline Aldridge, 41, wife of Finley Aldridge, died at 5:30 p.m. Thursday at the family residence, 1122 West Largent street. Mrs. Aldridge had been in ill health for six years and seriously ill with complications for three weeks. She was born in Sturgis, Ky., the daughter of Mr. and Mrs. R. B. Alexander, and in 1929 married Finley Aldridge of Harrisburg. She was a memeber of the Dorrisville Baptist Church. Surviving besides her husband and parents, are a son, Robert Finley Aldridge at home; a daughter, Mrs. Phyllis June Elder, Harrisburg, and two brothers Earl and Edward Alexander, both of Pontiac, Mich. The body received by the Turner funeral home, has been returned to the residence to lie in state. Funeral services will be held at 2 p.m. Sunday at the Dorrisville Baptist church conducted by the Rev. Floyd Jent. Burial will be in Lindale Memorial Gardens. Finley Aldridge, 51, died suddenly at 9:30 this morning at his home, 1122 West Largent Street. He had bee in poor health for over a year but died unexpectedly of a heart attack. Mr. Aldridge had been a miner and last worked at Sahara 7. He was born in Saline county near Palestine, son of William and Ella Aldridge. The body is in the Harrisburg funeral home and will be taken to the residence at 10 a.m. tomorrow. Funerla arrangements await the arrival of relatives. 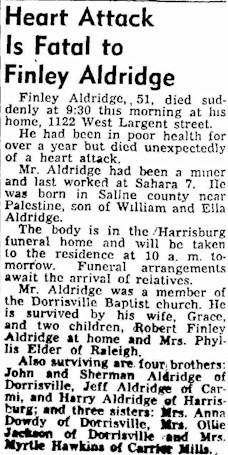 Mr. Aldridge was a member of the Dorrisville Baptist church. He is survived by his wife, Grace, and two children, Robert Finley Aldridge at home and Mrs. Phyllis Elder of Raleigh. Also surviving are four brothers; John and Sherman Aldridge of Dorrisville, Jeff Aldridge of Carmi, Harry Aldridge of Harrisburg; and three sisters: Mrs. Anna Dowdy of Dorrisville, Mrs. Ollie Jackson of Dorrisville and Mrs. Myrtle Hawkins of Carrier Mills. The funeral of Mrs. Willie Ann Hall, Harrisburg resident who died at the home of her daughter, Mrs. Ruby Gogue, Thompsonville, Saturday at 9 a.m. was today at 2 p.m. at the North America church. Rev. Alvie Daily, assisted by the Rev. James Upchurch, officiated and burial was in the Masonic cemetery near Raleigh. Mrs. Hall, daughter of the late Mr. and Mrs. John Miller, had been seriously ill for the past year, and her death was due to a cerebral hemorrhage. 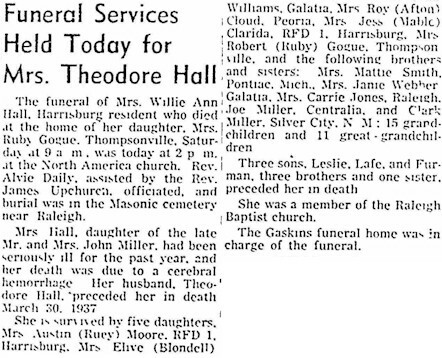 Her husband, Theodore Hall, proceded her in death March 30, 1937. She is survived by five daughters, Mrs. Austin (Ruey) Moore, RFD 1, Harrisburg, Mrs. Elive (Blondell) Williams, Galatia, Mrs. Roy (Afton) Cloud, Peoria, Mrs. Jess (Mable) Clarida, RFD 1, Harrisburg, Mrs. Robert (Ruby) Gogue, Thompsonville, and the following brothers and sisters; Mrs. Mattie Smith, Pontiac, Mich., Mrs. Janie Webber, Galatia, Mrs. Carrie Jones, Raleigh, Joe Miller, Centralia, and Clark Miller, Silver City, N.M.; 15 grandchildren and 11 great-grandchildren. Three sons, Leslie, Lafe, and Furman, three brothers and one sister, proceded her in death. She was a member of the Raleigh Baptist church. The Gaskins funeral home was in charge of the funeral. 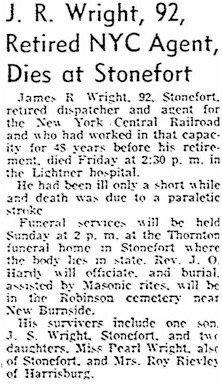 James R. Wright, 92, Stonefort, retired dispatcher and agent for the New York Central Railroad and who had worked in that capacity for 48 years before his retirement, died Friday at 2:30 p.m. in the Lightner hospital. He had been ill only a short while and death was due to a paraletic stroke. Funeral services will be held Sunday at 2 p.m. at the Thornton funeral home in Stonefort where the body lies in state. Rev. J.O. Handy will officiate, and burial, assisted by Masonic rites, will be in the Robinson cemetery near New Burnside. His survivers include one son, J. S. Wright, Stonefort, and two daughters, Miss Pearl Wright, also of Stonefort, and Mrs. Roy Rievley of Harrisburg. Mrs. Helen Choisser Wright, 84, of Harrisburg, Pa., died at her residence there this moring at 3 o'clock. She was the oldest child of the late Joseph and Vienna Choisser. She grew up in Eldorado and was married to the late E. B. Wright at the age of 18 years. Mr. Wright was engaged in the men's clothing business in Eldorado in the building now occupied by the Fashion Shop and Adams Insurance agency. He sold his business in 1914 and went to Idaho to work for the J. C. Penny Co. After a number of years there he was transferred to Warren, Pa. Upon retiring from the Penny organization he spent another year out west before locating permanently in Harrisburg, Pa.
Mrs. Wright is survived by the following: Two sons, Don of Lompoc, Calif., and Paul of Harrisburg, Pa.; two daughters Ellen and Emily Wright, both of Harrisburg, Pa.; a brother, P. T. Choisser, in Eldorado, one grandchild, one great-grandchild. She was an aunt of the following: Eugene, Ralph and Joe Choisser of Eldorado. Dr. John Choisser, Coral Gables,Fla., Mrs. Madelyn Holdoway, Eldorado, and Mrs. Ruth Valter, Coral Gables, Fla. The body will arrive in Eldorado late Tuesday afternoon and will be taken to the Martin funeral home to lie in state. Funeral arrangements are incomplete. 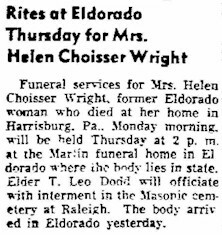 Funeral services for Mrs. Helen Choisser Wright, former Eldorado woman who died at her home in Harrisburg, Pa., Monday morning, will be held Thursday at 2 p.m. at the Martin funeral home in Eldorado where the body lies in state. Elder T. Leo Dodd will officiate with interment in the Masonic cemetery at Raleigh. The body arrived in Eldorado yesterday. Charles (Fern) Karnes, 54, resident of 1325 South Ledford stree, Harrisburg, died in the Lightner hospital at 11:15 a.m. Sunday. He ahd been seriously ill for about a week. He was a retired coal miner having last worked at Blue Bird mine No. 8. Born February 21, 1904, he was the son of the late Charles and Alice Karnes. 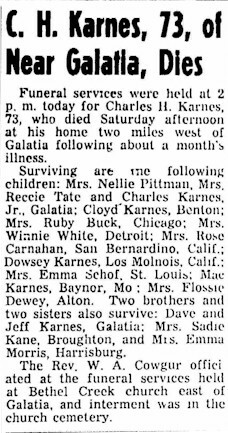 Mr. Karnes is survived by his wife, Vera; his three sons, Kenneth Karnes, Oxford, Mich., Kendall Karnes and Jerry Joe Karnes, East Detroit, Mich.; his sisters, Mrs. Nellie Kaiser, kansas City., Mo., and Mrs. Evelyn Grady, Chicago, his brothers, Bert Karnes, Washington, D. C., and Ben Karnes, San Pedro, Calif., and five grandchildren. The body will lie in state at the Gaskins funeral home until the funeral at 1:30 p.m. Wednesday in the Dorrisville Baptish church where he was a member. The Rev. William Fuson will officiate and burial will be in Sunset Hill cemetery. B. F. Moore, 91, Dies; Funeral Wednesday 2 p.m.
B. F. Moore, 91, 106 West Virginia street, died this morning at 1:50 at his residence. He was a retired carpenter and merchant and had lived in Harrisburg for 34 years. He was the son of the late Frank Moore and Elvira Hodge Moore. The funeral will be Wednesday at the First Methodist church at 2 p.m. Burial will be at Sunset Hills cemetery, and the Rev. W. L. Cummins will officiate at the services. Mr. Moore is survived by his wife, Julia, who is 89, and the following children: Mrs. Harvey (Lula) Vick, harrisburg, Mrs. Clyde (Gertrude) Bramlet, Harrisburg, Mrs. L. L. (Carrie) Riegel, Galatia, Mrs. Roy (Nell) Hall, Washington, D. C., Mrs. Russell (Eula) Gilliam, Golconda, Mrs. Ray (Florence) Parks, Raleigh, Mrs. Morris (Vannie) Darnett, Harrisburg, Mrs. Francis (Mary) Morse, Latonia, Ky., Arthur Moore, Harrisburg and Perry Moore, Harrisburg. He is also survived by a brother, F. H. Moore, Karsville, Ky., 29 grandchildren and 38 great-grandchildren. The body will be taken form the Gibbons funeral home to the residence to lie in state this afternoon. Mrs. Julia E. Moore died in her home at 106 Virginia street, Harrisburg, at 5:30 p.m. Thursday on her 93rd birthday. She had suffered a cerebral hemorrhage Thursday morning. She was the daughter of the late John and Icybinder Crank of Golconda and the widow of B. F. Moore who died Nov. 16, 1954. She was a member of the First Methodist church of Harrisburg and the American Legion Auxiliary. The body is in the care of the Gaskins funeral home and will lie in state at the family residence until the funeral at 3 p.m. Sunday. The funeral services will be held in the First Methodist church with the Rev. W. L. Cummins officiating and burial will be in the Sunset Hill cemetery. Mrs. Moore is survived by her children as follows: Mrs. Lula Vick, Mrs. Gertrude Bramlet, J. Arthur Moore, Perry Moore and Mrs. Fannie Darnell, all of Harrisburg, Mrs. Carrie Riegel and Mrs. Beulah Gilliam, Golconda, Mrs. Florence Parks, Raleigh, Mrs. Nell Hall, Washington D. C. and Mrs. Mary Morris, Fullerton, Calif., a number of grandchildren, great-grandchildren and two great-great- grandchildren. She is survived also by her sister, Mrs. Nancy Lockerby, Golconda and her brother, Marion Crank, Long Beach, Calif.
E. B. Wright, 87 year old former merchant of Eldorado, died at his home at 219 East Main, Shiremanstown, Pa. Thursday at 10 p.m. He left Eldorado several years ago to be associated with the J. C. Penny company and he was with the compant until his death. 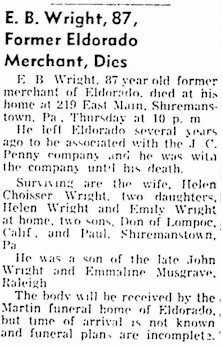 Surviving are the wife, Helen Choisser Wright, two daughters, Helen Wright and Emily Wright at home; two sons, Don of Lampoc, Calif., and Paul, Shiremanstown, Pa. He was a son of the late John Wright and Emmaline Musgrave, Raleigh. The body will be received by the Martin funeral home of Eldorado, but time of arrival is not known and funeral plans are incomplete. Lawrence E. Burnett of Los Angeles, Calif., who came to Eldorado several days ago on business, died at the Walker-Welborn hospital in Evansville this morning. 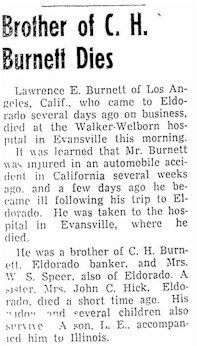 It was learned that Mr. Burnett was injured in an automobile accident in California several weeks ago and a few days ago he became ill following his trip to Eldorado. He was taken to the hospital in Evensville, where he died. He is the brother of C. H. Burnett, Eldorado banker, and Mrs. W. S. Speer, also of Eldorado. A sister, Mrs. John C. Hick, Eldorado, died a short time ago. His widow and several children also survive. A. Son. T. E., accompanied him to Illinois. Mrs. Bertie Wright, 70, former resident of Eldorado died at 10 p.m. yesterday at her home in Flint, Mich.
She leaves her husband, Willie, and the following children; Clarence, Bay City, Mich; Rober, Wendel, Mrs. Cal Gunter, Mrs. Gene Walls and Miss Velma Wright, all of Flint Mich. Mrs. Ralph Starkey, Garden City Mich. Mrs. Roy Biggerstaff, Brougham, Mrs. George Gobin, Harrisburn, ?? grandchildren and 17 great-grandchildren. The body is being returned to Eldorado by the Martin funeral home ambulance and upon arrival will lie in state at the funeral home. Funeral services will be held Friday the hour undertermined at Mt. Pleasant Baptist Church. Rev Carl ______ will officiate and burial will be in Sunset Hill cemetery. Charles Willis Wright, 73, died at the Ferrell hospital in Eldorado at 8:15 a.m. Thursday. Mr. Wright, a retired coal miner, had been a resident of Eldorado all of his life until he moved to Dale, less than a year ago. He had been in the Ferrell hospital for two weeks. His wife was the late Berttie Wright who preceded him in death in May of last year. Mr. Wright is survived by the following children: Clarence Wright, Wendel Wright and Robert Wright of Flint Mich.; Mrs. Carl Gunter of Flint, Mich., Mrs. Genola Goben of Gary, Ind., Mrs. Virginia Starkey and Miss Velma Wright of Detroit, Mich., Mrs. Letha Walls of Flint, Mich., and Mrs. Eva Bigger staff of Broughton. There are 35 grandchildren and 20 great-grandchildren surviving. The funeral will be held Sunday at 1:30 p.m. in the Mt. Pleasant Social Brethern church north of Raleigh. Rev. Carl Downey will officiate and burial will be in the Sunset Hill cemetery at Harrisburg. The body lies in-state at the Martin funeral home.